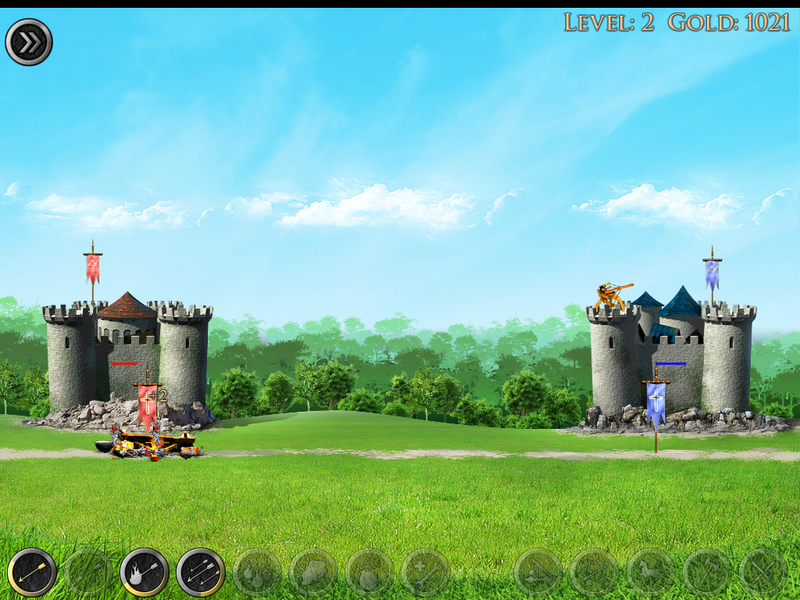 Unlike a lot of the castle defence games in which your opponent brings an onslaught to your doors, without giving you a chance to retaliate, Medieval HD lets you go head to head with the computer player in an all-out war waged between the two castles. In the beginning, you’ll be armed with only your trusty crossbow, but as you accumulate gold from all the enemy units that you slaughter you’ll be granted access to catapults, soldiers, horsemen, archers and axe-men which you can buy in-game to fight for your cause. In addition to all of the units that you can purchase, you can upgrade your crossbow; damage and faster reload speed for the primary attack but also additional arrows; piercing that can hit multiple enemies, fiery arrows, multiple shot, multiple shot fire arrows, even boulders and bombs can be used against the enemy. Whilst the computer doesn’t have a crossbow it has a few units that you don’t; suicide bombers who try and rush your castle, and balloons that shoot arrows and fire arrows at your units and your castle. This makes the game fairly well balanced, in general. Having said this, the user interface can be tiresome and clunky; the swipe to fire mechanic gets old quickly as you have to constantly do it every time you want to fire an arrow; even the auto fire scheme forces you to tap each time you want a shot fired which can wear out your fingers fairly quickly. Selecting weapons is more difficult than it should be too; you tap a button for a new weapon at the bottom of the screen and fire it, then you have to select a new weapon; it would have been so much better to have the game automatically revert you to the basic crossbow bolt as it’s the fastest to reload. Switching back and forth between weapons can get tedious for this reason and switching weapons becomes essential to take down the barrage of enemy units. Playing your own units against the enemy fast becomes essential. Archers are some of the best support units as they can stand their ground in the middle of the screen firing arrows at the castle and enemy units if they get close; we also liked to deploy a catapult or two to bombard the enemy castle. If you get enough of your own units set up you can use the crossbow to take out the enemy units before they get to yours. You can also win a round by capturing the enemy flag; simply have a swordsman, axeman or horse cross the screen and let them take the flag automatically to your side of the screen. It’s entirely possible to win the game in either of these two ways just so long as you’re keeping an eye on your own health. Medieval HD sports nine different environments which look stunning; it’s unfortunate that the game doesn’t utilise dynamic lighting because the pre-rendered castles stick out like a sore thumb on the night time backgrounds. And, your men don’t tend to carry the flag across the screen, merely just have it trailing behind them! But otherwise the presentation is really good—audio especially; it’s just a shame that the developer spoiled the beautifully presented interface with the functionality. 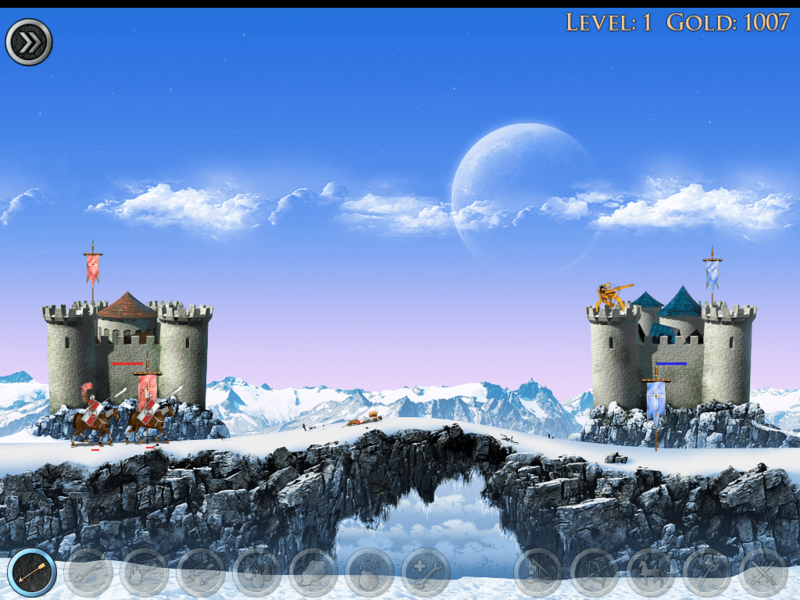 The game starts slowly, which can be a turn off; however, once you purchase some upgrades and start to battle your way through the never-ending series of levels, it gets really fun. The only gripe that we have is that once you’ve purchased all of the upgrades then there isn’t much left to do; a disadvantage of the endless mode for any game. Overall, Medieval HD is well worth a purchase; it looks stunning and the versus style of the game is certainly refreshing. Whilst it may not have the longevity it definitely has the style, polish and gameplay to make it worth the purchase. If you’re not sure, certainly try the Lite version available from the App Store. Ben is a special Guest Reviewer who runs (and writes much of the content for) his own iDevice-centric site, Games Uncovered. An enthusiastic gamer, Ben has spent much of his life playing video games, starting with early Mega Drive games and the GameBoy. (Devices Owned: iPhone 3GS, iPad). You can follow both Ben and his site on twitter at @ben_eb and @gamesuncovered.